The initial brief was to produce a banner that would represent the Public Schools from the Bathurst region. This banner became 17 when each school asked to have their own individual banner depicting the features of their school! When displayed collectively, the banners create a mural of the combined talents of each school, capturing their sports, arts, academic pursuits and physical beauty. They represent the collective strength, unity and depth of the public schools within the Bathurst region. Each banner is 2m x .8m and is proudly displayed in the foyers of the schools, but also regularly displayed in their collective entirety at events such as Education Week, public performances and other special occasions. Constructed as quilts, each banner has 3 layers, binding and hanging sleeve. 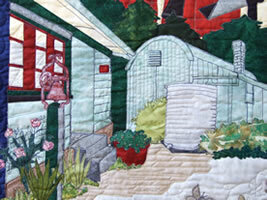 The quilt tops are raw edge machine applique, using a meandering “scribble” style straight stitch. 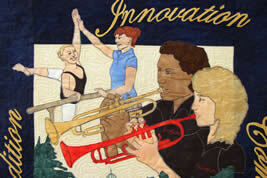 The first of the banners were quilted on a domestic machine with subsequent banners progressing to long-arm quilting to speed up the construction phase. Each banner began as a series of photographs at the school which were then designed into a drawn layout from which a full size pattern was made to begin the applique process. It took two years to complete the 17 quilts required for this project and culminated in a special award night in November 2008. I am very grateful for the opportunity that came my way and always have a wonderful sense of pride when I see my work on display at the many schools in the Bathurst district.